Peter Mockaitis is helping transform students into leaders with hilarious, interactive programs. ▪Why Must I be Surrounded by Idiots? 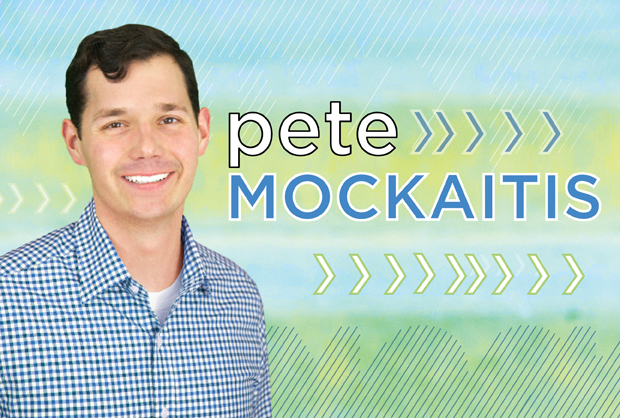 Pete has served clients in 50 countries, led nine student organizations and has written two books… but most importantly, he’s know how to have fun with his audiences and lead engaging and creative keynotes. Pete’s on a mission to help students achieve greatness by sharing the most powerful wisdom that makes it happen. Students love Pete’s quirky blend of humor, interactivity, and ENERGY! Their organizations benefit from his practical, research-based insights and follow-up materials that reverberate across campus. Pete Mockaitis (Muh-KITE-iss), is an author and coach who’s served clients in over 50 countries. Pete’s work has enhanced Fortune 100 corporations, high-growth startups, major nonprofits and an assortment of student groups. Having led nine student organizations, he believes students should make a tremendous impact right now—rather than waiting for “when they become leaders.” This conviction led him to write The Student Leader’s Field Guide and Team Up while a student at the University of Illinois. His work with students has earned him recognition from the Jaycees as 1 of 10 outstanding young people of Illinois, alongside professional athletes and other notables. learn important lessons from their successes and failures. Pete’s hilarious, passionate delivery provides enough laughs and real-world examples to kick your organization into high gear. You can make this a legendary year, and Pete will show you how. how to effectively learn from their successes and failures. Times are tough for recent college graduates and their wallets. The average graduate walks off stage with a diploma and a record-high $35,000 in student loan debt. It takes, on average, 21 years to pay that loan off. Meanwhile, nearly half of recent graduates have settled for jobs that don’t actually require a college degree. Getting a “real job” after graduation is becoming more and more critical…yet more and more difficult. There’s hope. In this powerful, practical keynote, Pete shares his best insights gleaned from conducting over 400 1-on-1 career coaching sessions with clients from over 30 countries. He provides actionable wisdom in this essential guide to job hunting for college students. Pete dispels myths, shares insider secrets, and helps students sharpen the key skills required to nail each stage of the job hunt. Reflection: How to discover your passions and the work you’d love to do. Research: Where to look for the opportunities. Networking: How to find the right people to impress—and then impress them! Writing: How to craft killer resumes and cover letters. Speaking: How to answer the toughest interview questions. When the economics of being a 20-something feel overwhelming, Pete brings the peace of mind that comes from building a solid plan. You’ve probably heard older folks refer to today’s generation of college students as the “entitlement generation.” Maybe you find that label unfair and inaccurate. Or maybe it feels about right. Either way, it’s easy to be misled that results come easily in the age of Zuckerberg, reality TV stars and Tim Ferriss’s 4-Hour Body/Workweek. In this eye-opening keynote, Pete reveals how we’ve been deceived by pop culture and what to do about it. Pete provides a thought-provoking ride from The Bachelor to infomercials that resets our expectations. With hilarious stories, multimedia illustrations, and insightful data, Pete destroys myths and spells out the real success factors required to achieve our dreams. In his keynote, 6-Figure Salaries and 6-Pack Abs: What our generation is really “entitled” to—and how to get it. You can rise above the myths to turn dreams into reality with Pete’s formula for success. These timeless five steps empower you to turn dreams into plans—and plans into reality. the five keys that differentiate those who dominate from those who drift. Student leaders have challenges coming at them from every direction. Sometimes, it’s enough to drive you to the edge of sanity! Have you ever found yourself losing sleep because too few members are coming to meetings? Too few officers and chairs are doing their stuff? Too few people are coming to events? Too few members are paying their dues on time or meeting deadlines? Have you ever just felt exhausted from the whole “leader thing?” There’s hope. In this engaging keynote, Pete helps you put things into perspective and offers tactics to immediately transform frustrations into possibilities. This program can be conducted as a keynote for a large group, or an interactive workshop or a breakout session for smaller groups. Pete offers his perspectives and then facilitates group dialogue so everyone’s solutions can be used to restore the fun—and successes—to student leadership. follow up on individual commitments toward action items. This program is a perfect addition to new officer training and transition events and may be added to any of Pete’s keynotes at no extra charge. Meetings can be a source of tremendous energy and excitement, and Pete will show you how to make it so. Why Must I be Surrounded by Idiots? your personal, four-letter type “code,” and what it means. Pete brings an ordinary topic to extraordinary life through highly-relatable stories and interactive exercises that leave students nodding their heads, laughing, and excited to learn more about their members’ uniqueness. Let Pete show you how to turn personality conflicts into a source of great strength.